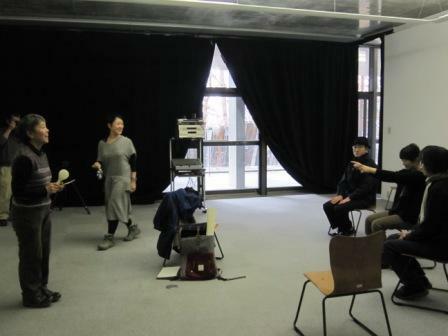 We had a closing performance on the last day of the AIR Exhibition by YAMASAKI Ami (participating artist), KYOGOKU Tomohiko (guest dancer) and participants of the Yamasaki’s workshop. 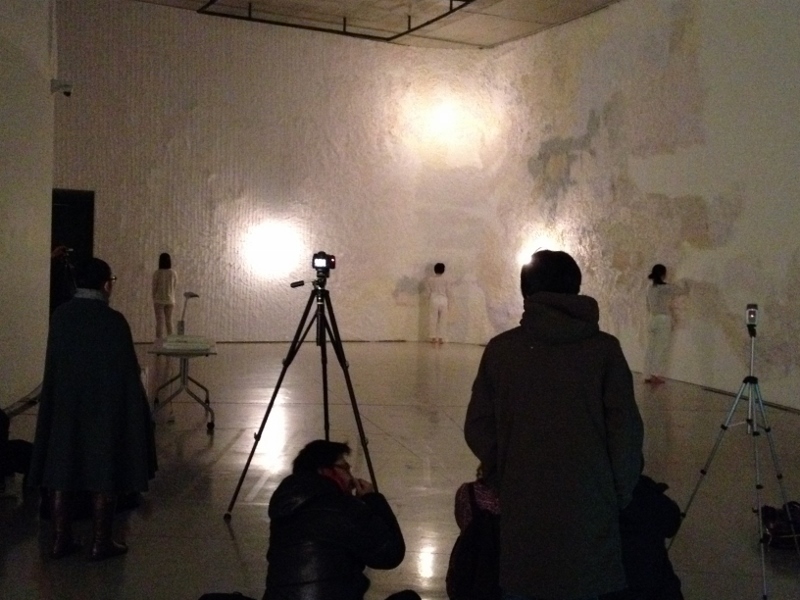 At the beginning, participants of Yamasaki’s workshop came into the Yamasaki’s installation space and made sound using feather-paper. 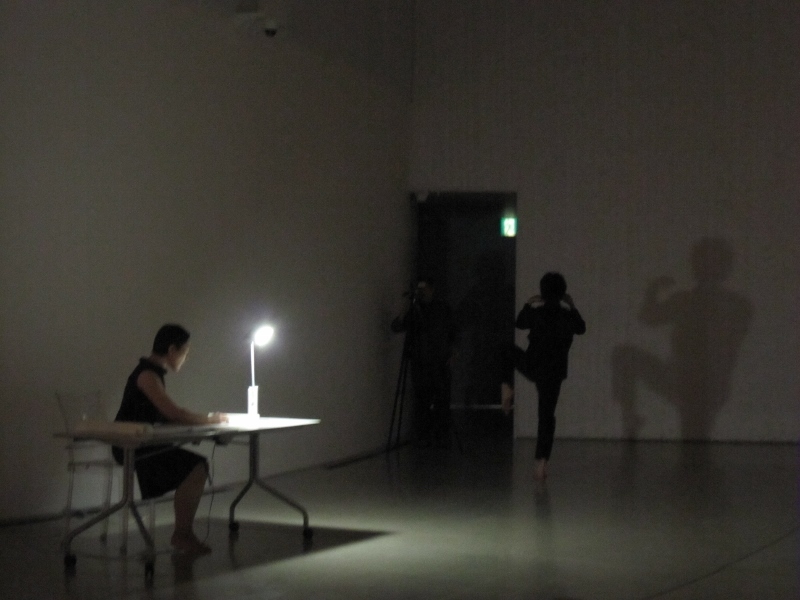 A dancer, SAYANAI Mari who is living in Aomori was participating in this performance. It seems like a session and at the same time it seems like a dance. It had strange stateliness. 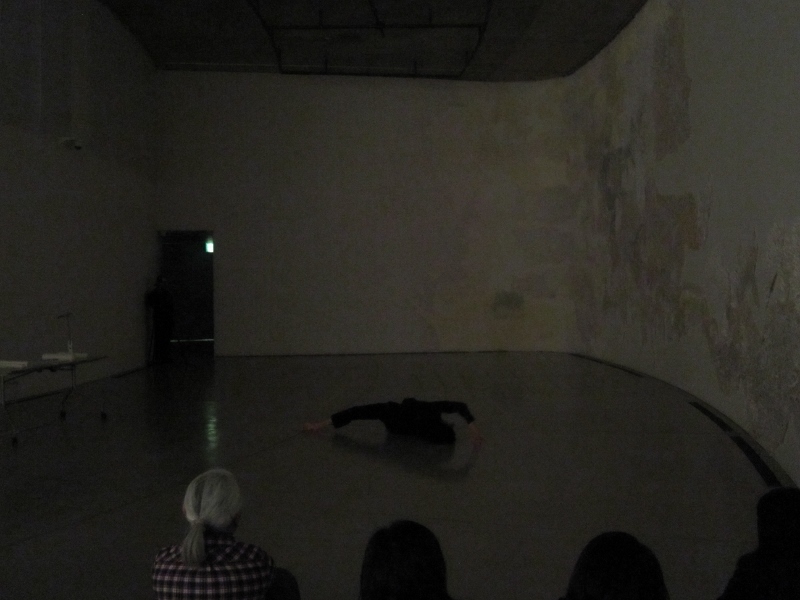 When KYOGOKU Tomohiko, a guest dancer, slowly moved into the space without sound, the light turned off. It is contrastive to a previous white image. 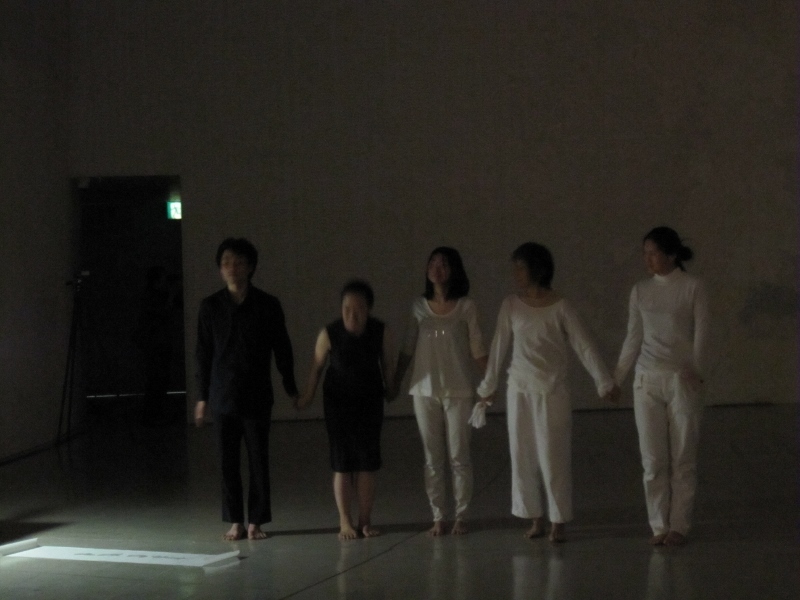 The way of the Kyogoku’s movement without sound in the darkish room, in black cloths, made us feel shadow. Yamazaki in black came in the space. The movement of Kyogoku which did not make us feel gravity. The Yamasaki’s animal-like voice. 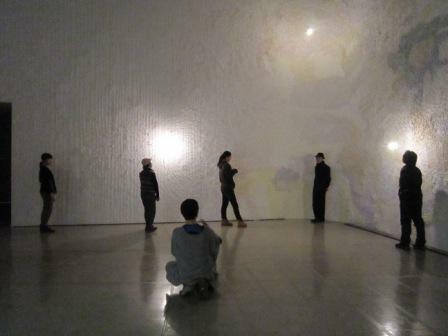 Because of the feature of the gallery space, all sound could hear from different points from the source of generation. They made our sense ambiguously and confuse. 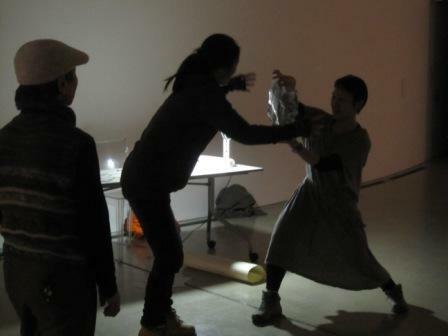 At the end of performance, the next residence artist, NAKAZAKI Toru was introduced by Yamasaki and Yamasaki passed a baton to him. 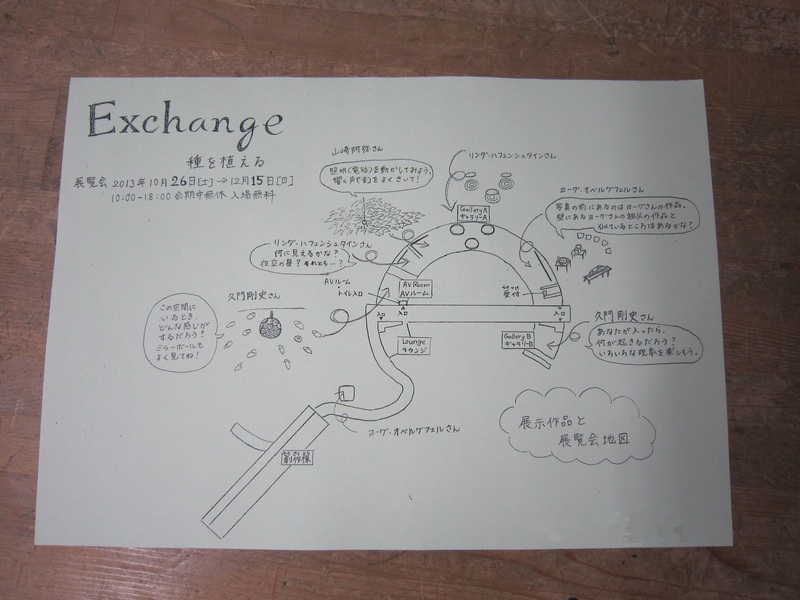 Finally, the AIR program in 2013 “Exchange” finished. 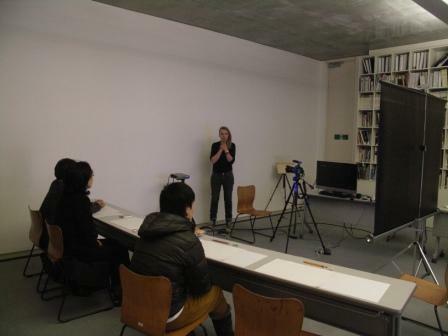 YAMASAKI Ami’s workshop “Welcome the sounds” was held on 1st December. First, they had a listening game. 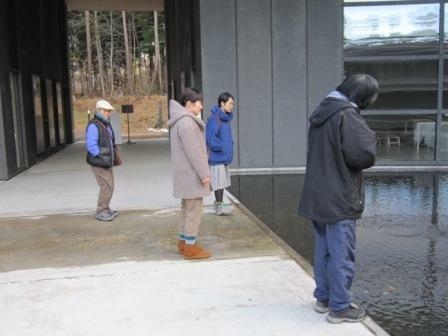 Yamasaki and another participants made the sounds, and the another close their eyes and point the place where the sounds from. 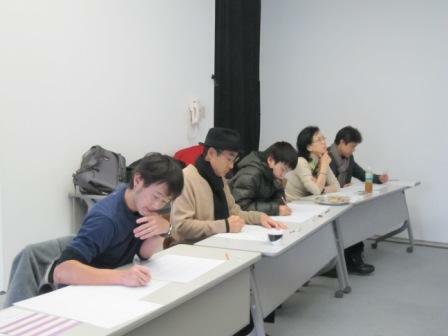 Then, they practiced ”lintening work” which is looking for the sounds in some dintence. After that wolk around ACAC with listening the sounds. 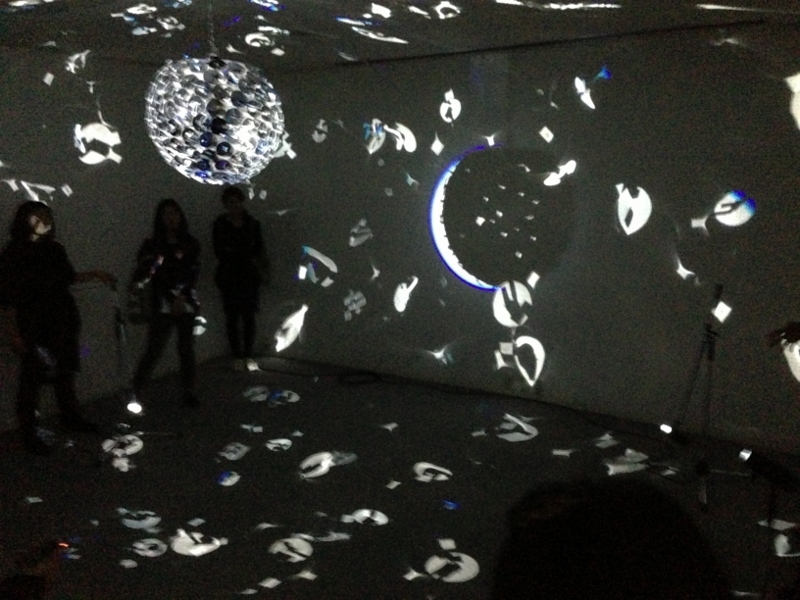 Then went to the Gallery A. They had another activity, that is hand over 3 different papers to the others without any sounds. This is for focusing on the small sounds. Next, touch the fether and make the sounds. Yamasaki call this that playing the artwork as the instrument. 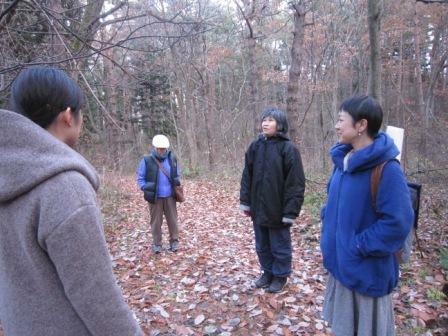 You can see their performance with Yamasaki’s voice and KYOGOKU Tomohiko’s dance on 15th December. 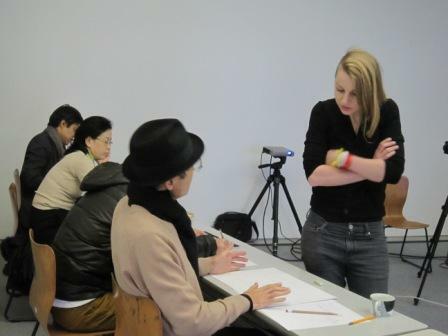 Linda HAVENSTEIN’s workshop “statements” was held on 30th November. The participants thought about some words or sentences for putting on the underline. There are 2 rules for the words and sentences. 1, write 15 words and sentences when you introduce or explain yourself for the others. 2, write 15 words what your mother think about you. Both sentences has “I” as the subject. pattern1 is what you think about yourself, and pattern2 is someone who are very close to you. Then they choosed 10 sentences which you can not say to the other people normaly. 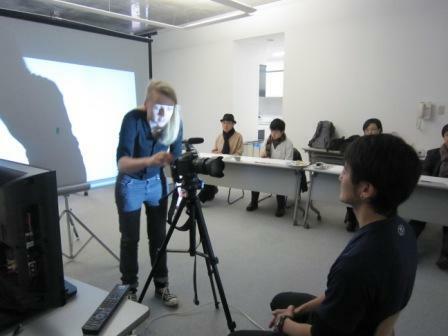 In the afternoon, they speak 10 sentences in front of the camera. First, they speak their sentences. Next, they change the paper with other participants, and speak the others sentences. And this time, the subject of the sentences are “I”. We could see their face changed a bit. They were speaking the other’s word but some of them sounded like their word. Finaly, mix everyone’s words, and picked up 10 words, and spoke again. 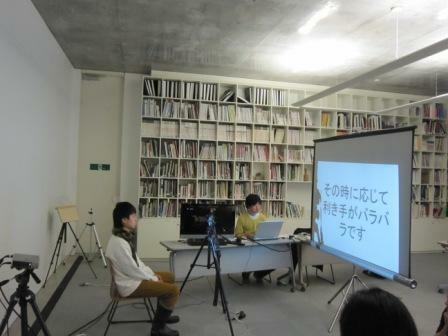 The activity was just simple such as making the words then speak. But the repetition of simple activities made them think about themself deeper. 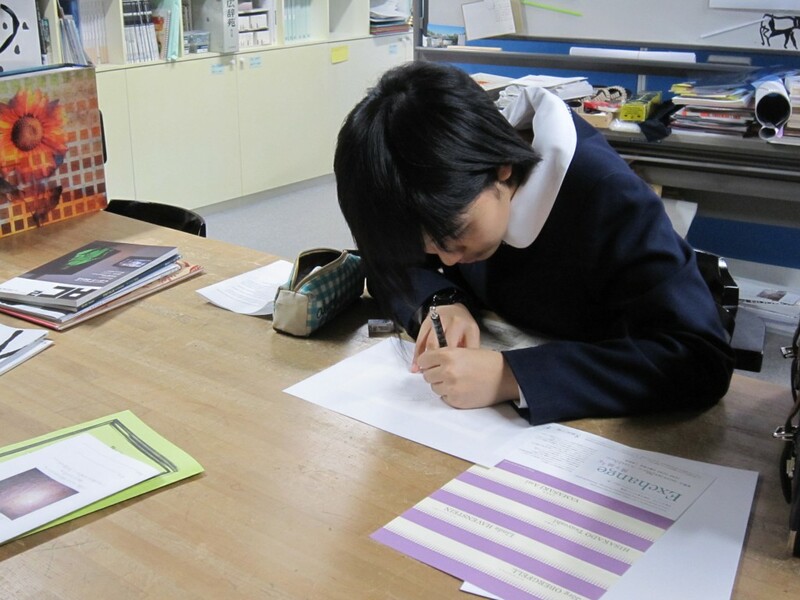 A junior high school student visited ACAC for “job experience”. She tried to do information clerk, and to make exhibition map. She did very good job! You can take her map at information desk at gallery A. 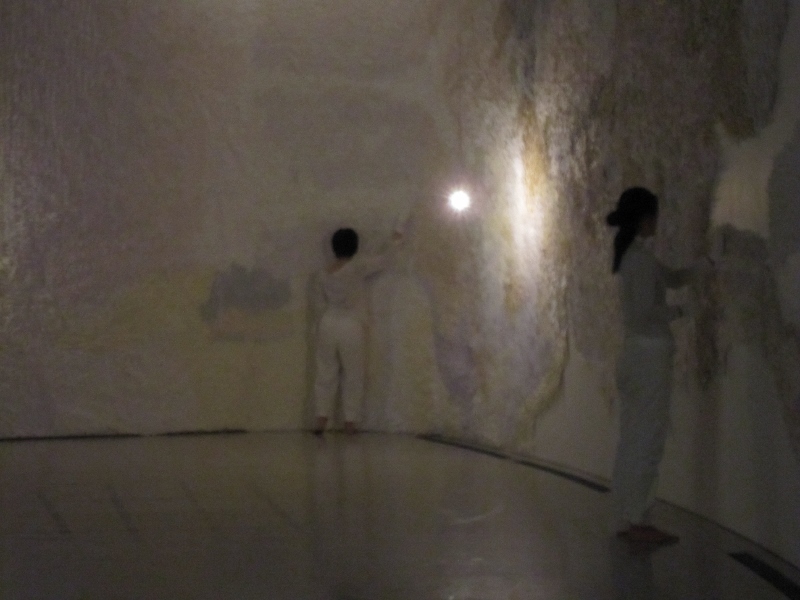 Since October 26, the exhibition of the Artists in Residence Program 2013/ Autum “Exchange — Planting the seed” has opened. 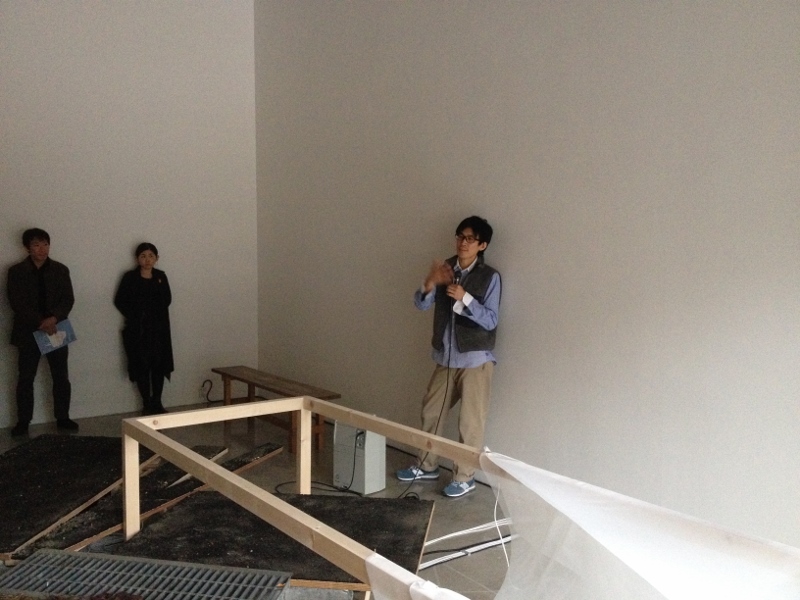 On the opening day, we run the artists’ talk by all participating artists. The artwork of Jörg OBERGFELL tries to give the theme of “Exchange” conscious about his grandfather’s objets. 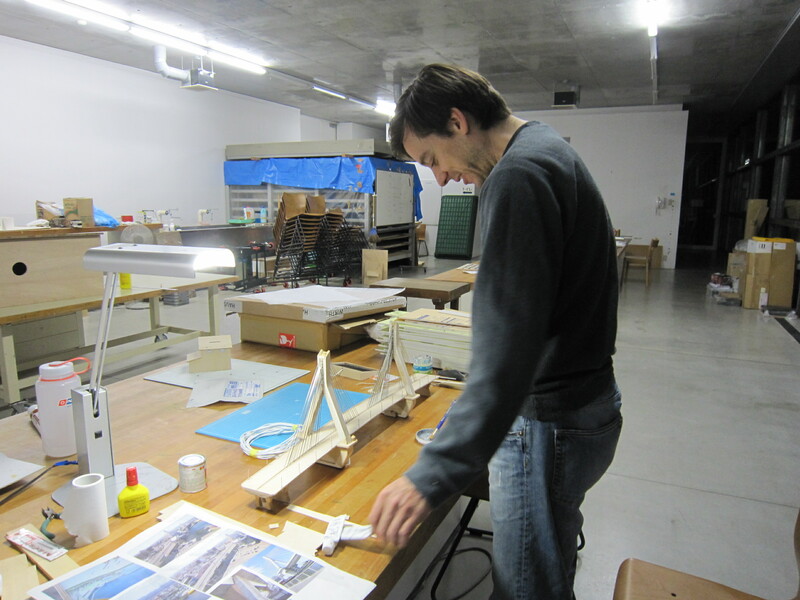 Obergfell produced artworks thinking about the exchange with times, places, methodologies of art and so on through reproducing some objets by his grandfather’s way. We, human beings, found the order and rule from the cosmos and　established various value systems. The artwork of Linda HAVENSTEIN is related with these ideas ancient and evoked the exchange point of the micro-cosmos and macro-cosmos. 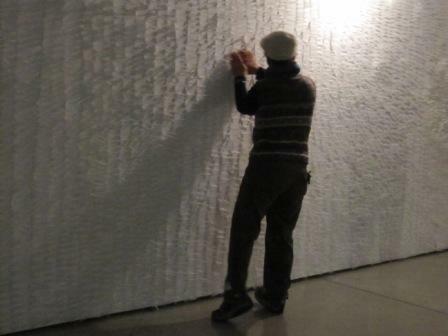 HISAKADO Tsuyoshi focus on the boundary and time on his artwork. 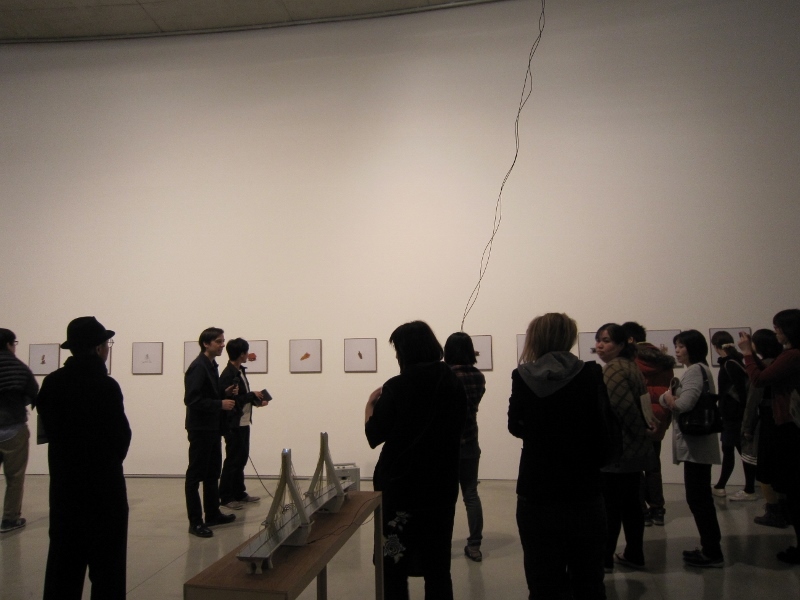 He collected several everyday things and sound from around ACAC and reconstructed them in the gallery B. The artwork that is installed at the AV Room. It is like on the way of the time traveling. 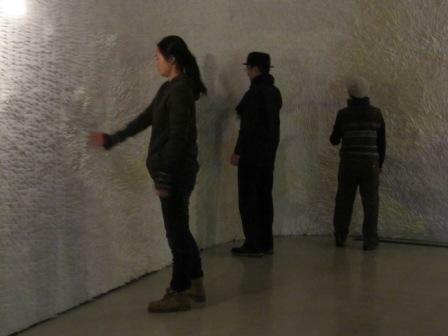 YAMASAKI Ami changed the form of the wall and put countless feathers-like papers on the wall and tried to change the echo of Gallery A. On the opening day, she did the voice performance. 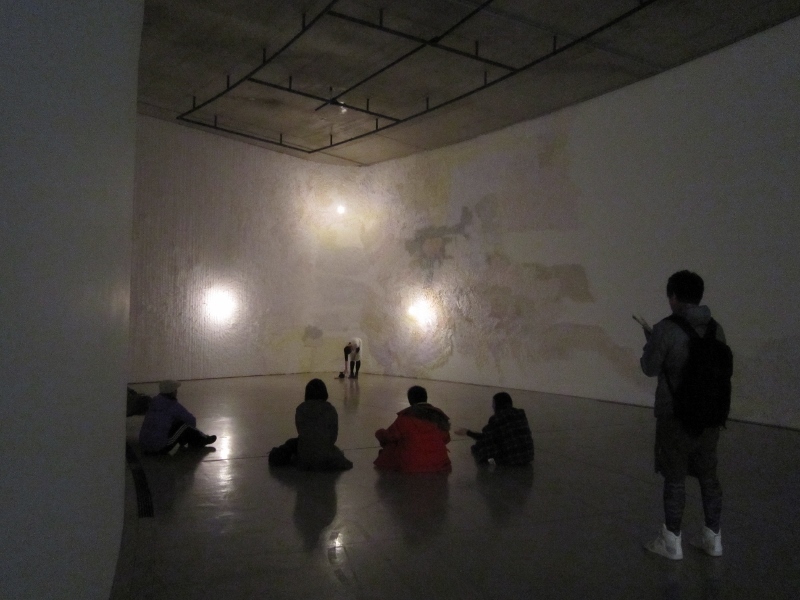 Because of the artwork, the sound is heard from the other side of the gallery and it was like the sound in the cave. 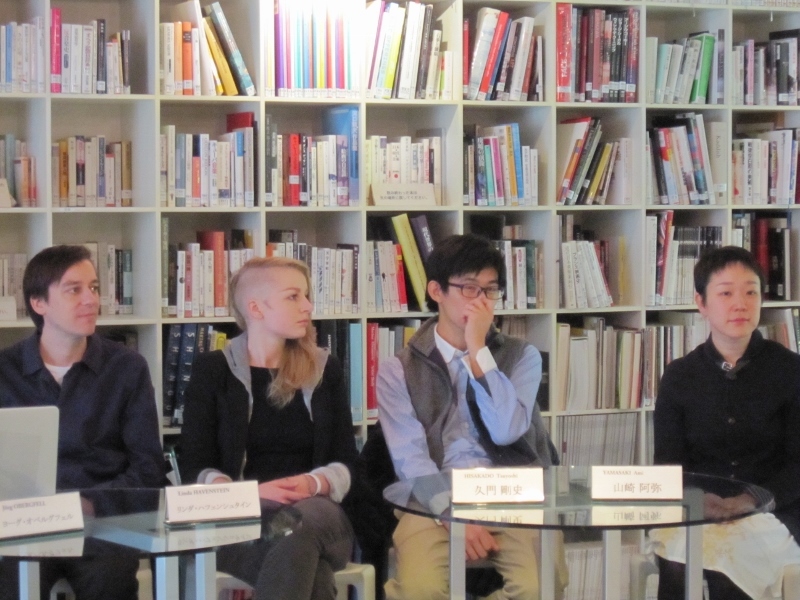 Almost artists said that they will continue to work and add their work during the exhibition period. 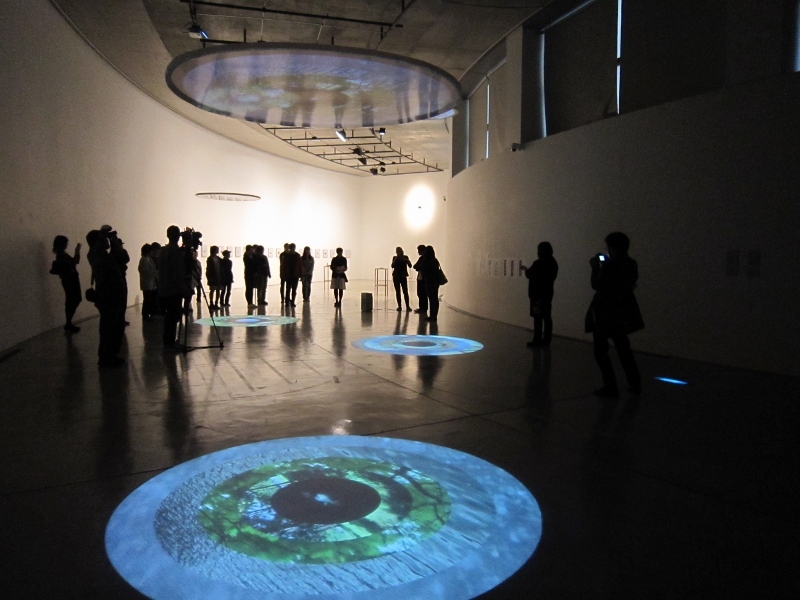 We wish you enjoy repeatedly the process and changing of artworks of this exhibition. The Exhibition will start in 1 week. All artists are having tough time for installing. 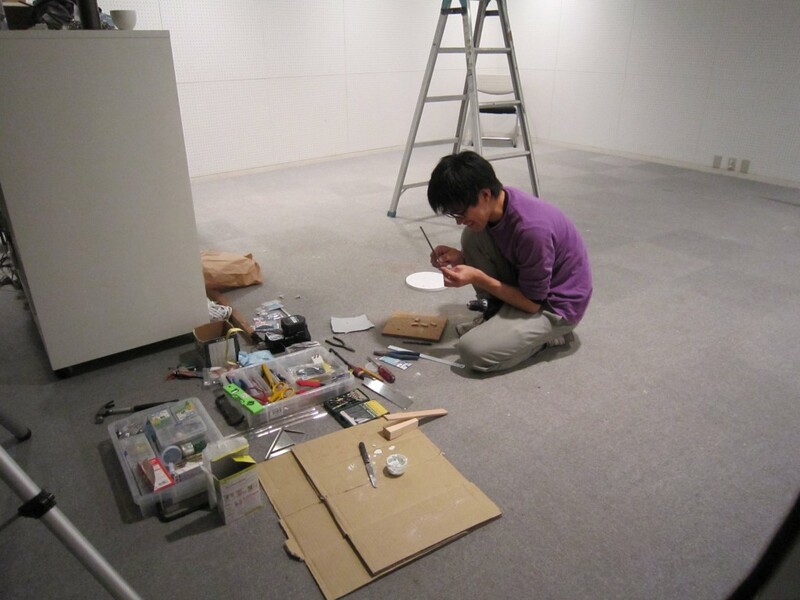 HISAKADO Tsuyoshi, is working at AV room. 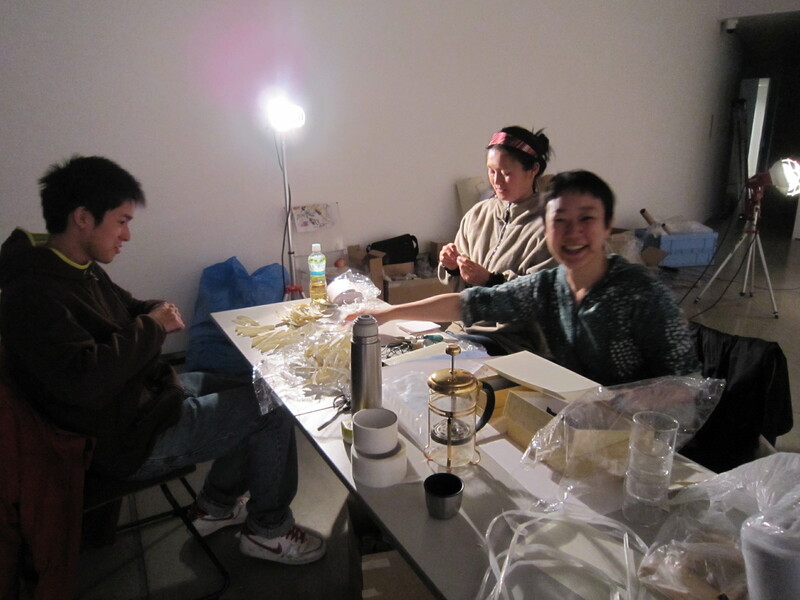 YAMASAKI Ami is working with the volunteer staffs and making the wings. 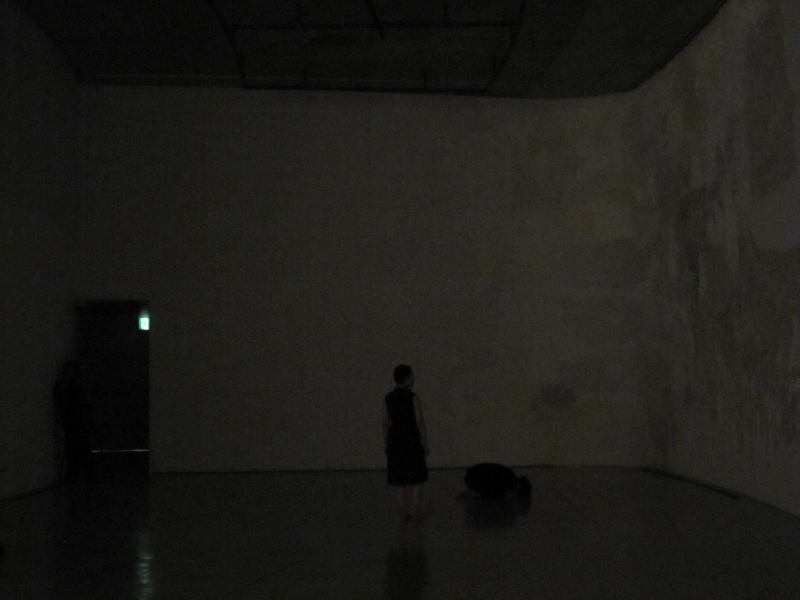 Linda HAVENSTEIN is checking the projection on the gallery floor. 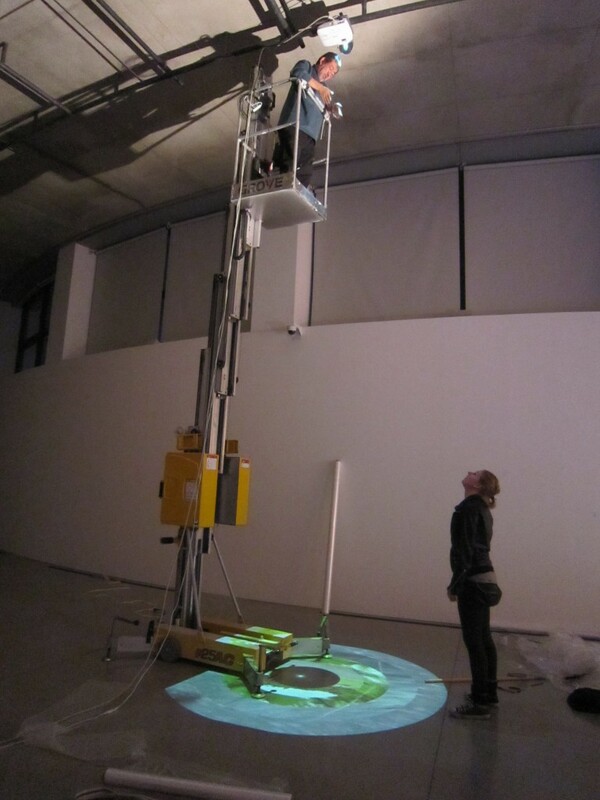 Jorg OBERGFELL is painting new sculpture.